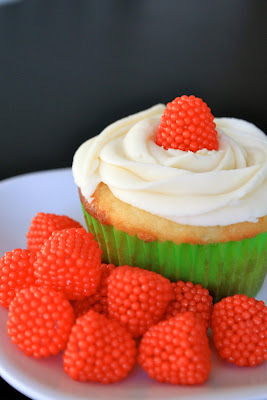 As promised, the non-sugar free counterpart to last post's Sugar-free Lemon Berry Cupcakes. I actually did not try these. I took half to work and Zack took half to work and they were gone before I knew it. I was told they were delicious though. You may have noticed that I think lemon and berries go extremely well together based on these posts: Lemon Cupcakes with Blueberry Buttercream and Lemon Glazed Triple Berry Scones. As Autumn is around the corner there will likely be less lemon berry combinations for a while on Baked Perfection, so I have to enjoy it while the last few warm days are here. I hope you enjoy my latest creation. In a medium bowl combine the flour, baking soda, and salt. In a separate mixing bowl, cream the butter and sugar. Beat in the eggs, one at a time. Add the lemon zest, lemon juice and vanilla; mix well. Add the flour mixture to creamed mixture alternately with sour cream (batter will be thick). Fill greased or paper-lined muffin cups with 1/4 cup of batter. Bake at 350 degrees F for 25-30 minutes or until a toothpick inserted near the center comes out clean. Cool completely. Once cooled, fill a piping bag with a small round tip and raspberry preserves. 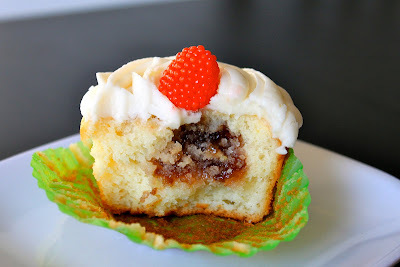 Insert the tip into the the cupcakes and squeeze until a little bit of jam pops out the hole on top. Frost with vanilla buttercream. Cream butter and vanilla. Gradually add one cup of sugar at a time, adding the milk in between each two cups. Beat until fluffy, adding more milk if needed.